You can import fault in the VoxelGeo XYZ, GeoQuest IESX or in the DUG fault (.dufault) format. In the GeoQuest IESX format, you can load multiple faults from a single file. The .dufault file consists a single X/Y/Z point per line, separated by whitespace, with a blank line indicating a new fault stick. The following example shows a .dufault file with three fault sticks, each stick having three, four, and four points, respectively. Columns 4 and 6-10 are not used. A data row must be at least 47 characters long. If stick index contains a space character, only the characters [32-35) are used. Note: The index ranges, e.g. [16-32) are zero based. The first value is inclusive, the last is exclusive. If you want to load multiple fault sticks in GeoQuest IESX format, you should first select all the fault sticks that you want to use and export them to a single file. Select the fault file to be imported and click Open. Define the time/depth domain for the fault. 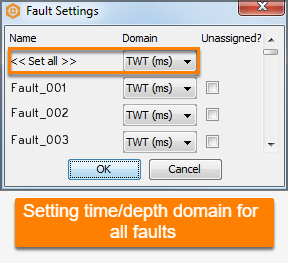 If you are loading multiple faults, you can select a time/depth domain for all the faults at the same time by setting the domain at << Set all >>. Click OK to import the faults. Select the fault file containing the unassigned fault sticks that you want to import and click Open. The Fault Settings window will be displayed. At Domain, select time or depth domain to import the unassigned fault sticks on the selected domain. Select the Unassigned? check box to indicate the fault sticks as unassigned. Note: If you want to assign the fault sticks upon loading, clear this check box. 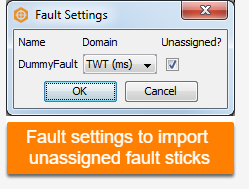 Click OK to import the unassigned fault sticks.